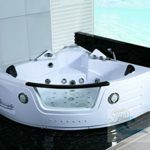 2 Person Corner Bathtub Computerized Whirlpool Jetted Hot Tub (White) Model #SDA050 White, 30 Amp – Sorry, no shipping to NY State. These ship BRAND NEW in a sealed factory crate. Please ensure phone # is included, it’s required before we will ship. THESE ARE 100% FULLY UPGRADED. Heater Pump installed – Helps to keep the water hot with no need to add more water! Exterior Dimensions: 62″ length x 62″ width x 25″ height Overall. USA Customer and Warranty Service.